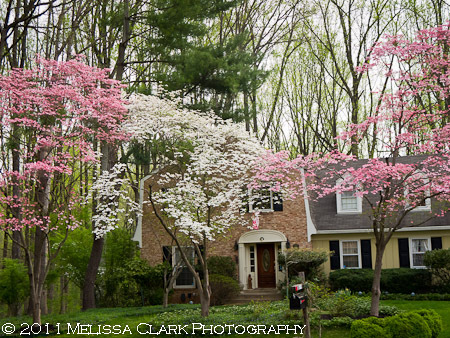 This year the flowering dogwoods (Cornus florida) have been nothing short of spectacular here in the metro DC area. These “four-season” trees are treasured for their flowers, berries, fall leaf color and arresting horizontal habit. Like this one. 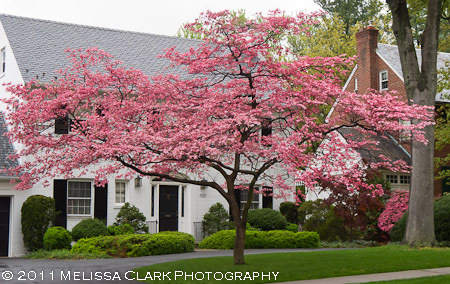 A deep rosy-pink Cornus florida in peak bloom near my house. A single specimen, like the one above, is breathtaking in its shape and its flowers. 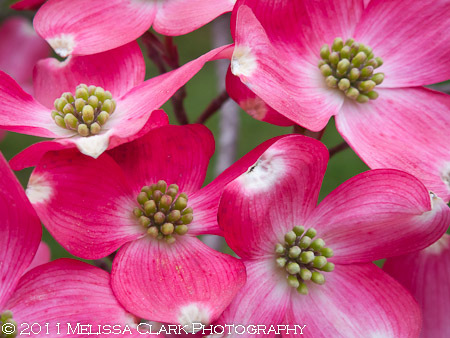 The cross-shaped appearance of dogwood bracts (the "flowers" are in the center of the grouped bracts and will eventually open, themselves). Here I think the Canon G11 has over-saturated the colors a bit. The flowering dogwood is native to North America (I once heard a British garden owner bemoan the fact that she couldn’t grow them in the UK). Often seen on the edge of woodlands, it is a classic “understory” tree that usually reaches heights of about 20 to 25 feet, with a very wide spread. 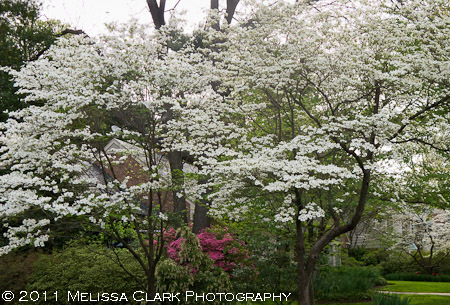 Two white flowering dogwoods with branches blending into each other's space. 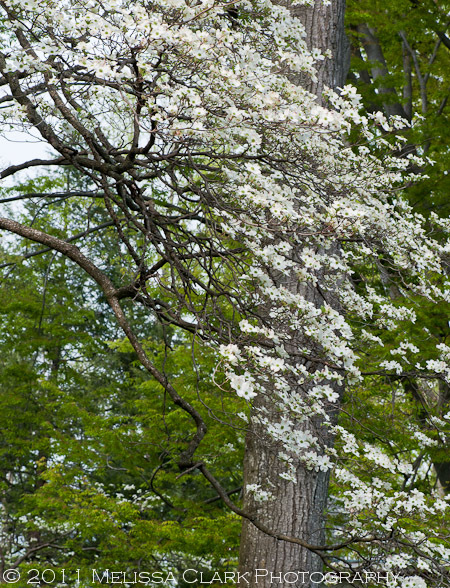 Despite what the books say, in some instances you run across flowering dogwoods that have grown 30′ or more, reaching for the sky, especially where light is scarce, and as they age losing lower limbs in the process. I found such a beauty in the garden of a client nearby recently. A high-canopy, older dogwood still radiantly beautiful. I mentioned a “love-fear” relationship to these beautiful trees. As beautiful as they are, I have been reluctant to plant them for clients unless specifically requested to do so. That’s because of anthracnose, a deadly disease afflicting Cornus florida along the East Coast. It claimed two of the five dogwoods that were in my own garden when I moved in. Two are left, holding their own, although one lost major branches this year thanks to a heavy snowstorm. That one now looks like a fork stuck in the ground. But the other one still entrances me with its white blossoms every year, and I hope to have it in my garden until I’m no longer the gardener.